Monterey County grows over 50 different varietals of grapes and yet it seems that most of them go unnoticed or at least uncelebrated as premium wines. 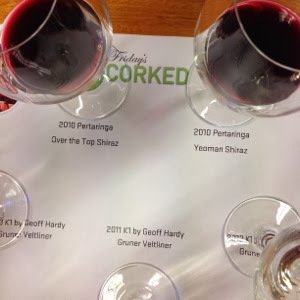 While a number of people tend to think of Monterey wine tasting as one long procession of Chardonnay and Pinot Noir, and while that is a large portion of what is made and poured, it is far from all that can be savoured. Now while we do really enjoy the wonderful Pinot Noir and Chardonnay that is made and poured in Monterey we also like Cabernet Sauvignon, Syrah, Chenin Blanc, Sauvignon Blanc, Merlot, Sangiovese and Malbec as well as many other wines.With this being Cabernet month ( #Cabernet day is August 28th) we turned our attention to Monterey Cabernet and dinner time. When thinking of Cabernet most peoples thoughts go immediately to Napa Valley or Paso Robles, but you may be surprised to find some equally good reasonably priced Cabernet and Cabernet blends right in Monterey County. With Cabernet Day just around the corner we at WineWalkabout decided that we would sample (read drink) some of the best Cabernet Sauvignon poured in the local tasting rooms and let you know about what we chose to drink with our meals and that most importantly we really liked. 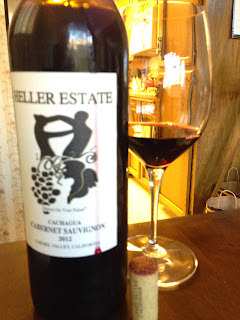 Wine; Heller Estate Organic Vineyards 2012 Cachagua Cabernet Sauvignon. 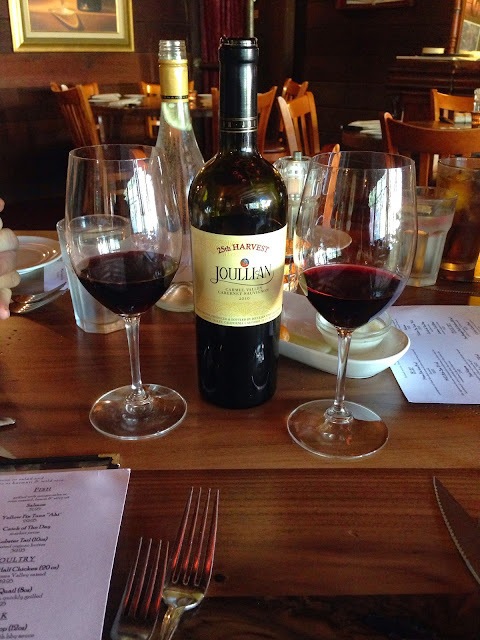 This wine is made from 100% certified vineyards from the Cachagua region of the Carmel Valley and is comprised of 77% Cabernet Sauvignon, 23% Merlot aged in 100% neutral French oak barrels. No fining but polished filtered through 3µ filters. The winemaker says that the 2012 growing season was marked by a relatively cool summer, as summers go in the Cachagua Valley. But the season was long with no early rains which allowed them to keep the grapes on the vine as long as they wanted. The resulting color is a deep garnet to dark cherry color with a fruit forward nose with big notes of blackberry, raspberry and a little cedar. On the palate it is bright with nice dark and some red fruit flavors that fill the mouth. The flavors of black cherry and blackberry and a little . Also look for some subtle jammy characters to show through on the mid-palate. A little sharp at first, once swirled a bit the supple and balanced tannins linger on the finish. This *** wine rates a 7 on the official scale and we would drink this for dinner a bunch. A little (12mths) time will really make this a go to organic grape wine. The wine paired well with the BBQ, A-1 sauced oven baked chicken drumsticks but would go well with steaks and good burgers or some red sauced Italian. 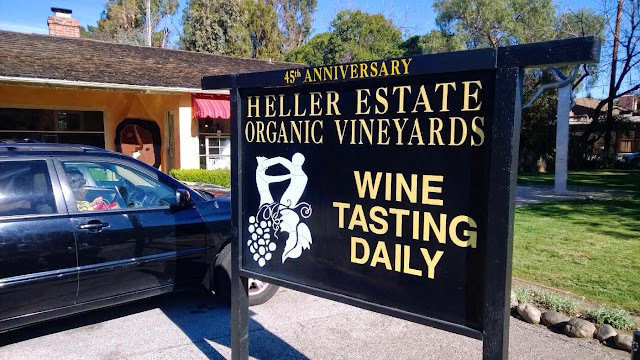 Head on out to Carmel Valley and have a taste of the Heller Estate Organic Vineyards range of wines and find your new favorite tipple. Tell em we sent you. The wine; Joullian Vineyards 25th Harvest 2010 JOULLIAN CABERNET SAUVIGNON • Carmel Valley Estate made up of 87% Cabernet Sauvignon, 10% Merlot and 3% Cabernet Franc combine in this lovely drop. !00% from their Estate Vineyards in Carmel Valley and spending twenty months in 20% new and twice used Center of France oak barrels. Bottled unfined/unfiltered and a surprisingly low 13.0% alcohol content. This wine is quite a dark purple / garnet color with a brilliant cherry rim. With an enticing nose of anise, black cherry, Black current coffee and cola notes. It is a bit tight but a lovely black fruit hits the palate on first taste and expands to include dark cherry, plum, blackberry and sweet anise flavors that finish with nice acidity, fine to medium tannins provide a medium long finish. This Cabernet will stand the test of time we think due to its acidity and elegance. The winemaker reckons it will cellar thru 2025. With a rating of *** and a 7 we are not going to wait as this is drinking nicely now and we are always looking to the next release with excitement. The wine’s balance and acidity will be a great match for steaks, rack of lamb, pork loin or chops, prime rib, turkey legs, and rotisserie or BBQ chicken. 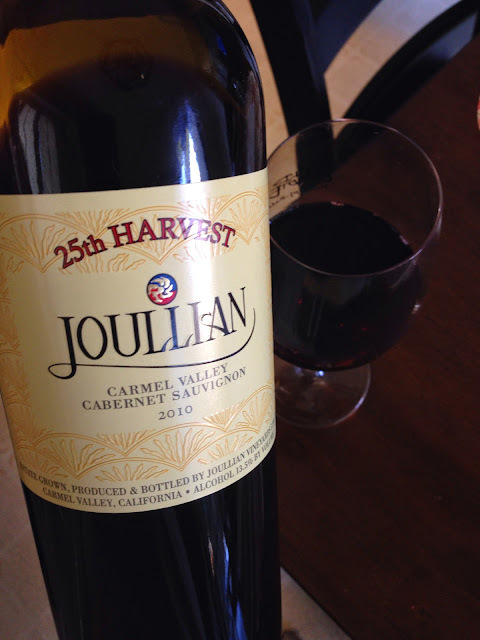 Go on and head on over to Carmel Valley and get yourself a tastes of the Joullian Vineyards wines and tell em we sent you! When thinking of Cabernet in California most peoples thoughts go immediately to Napa Valley or Paso Robles, but you may be surprised to find some equally good reasonably priced Cabernet and Cabernet blends right in Monterey County. The food; Penne pasta with home made mushroom and meat sauce. 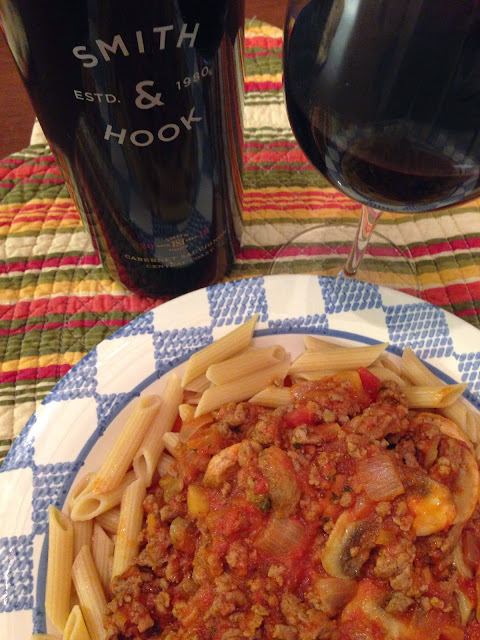 The Wine; Hahn Estate 2012 Smith & Hook Cabernet Sauvignon Central Coast. This Monterey based winery sources grapes from a number of areas to make what they feel is a wine worthy of their customers and they happen to get the grapes for this Cabernet from vineyards in San Antonio Valley, Arroyo Seco and Paso Robles. This very enjoyable wine is poured and can be enjoyed in their Monterey tasting room. This **** wine rates a 6-7 on the official scale and is a great anytime Cabernet. This is a very easy to drink Cabernet that shows great care in blending the various vineyards to produce a wine that drinks way above its price point. This Cabernet has a bright purple color with blackberries and black current with a little cedar and cassis on the nose. The texture on the palate is full and warm with solid tannins that provide a solid frame for black cherry flavors and soft spicy notes of vanilla and cloves and well integrated tannins that give a nice medium length finish. The nice relatively full mouthfeel and fairly robust flavors were a perfect complement to the very meaty pasta sauce but would also go nicely with hearty beef and game dishes or one of our favorites, a big juicy bacon cheeseburger. Head on over to the Hahn Estate tasting room enjoy the spectacular views from the deck, sample the wines and make sure not to miss this one. We recently received this wine to taste and comment on. Once properly rested and chilled it was opened and wow, its a little fizzy. Not in the sparkling wine way but fizzy. It has nice stone fruit flavors to go along with enough acid at the finish to make your mouth water and beg for more. This wine is called dry but has a subtle fruit sweetness to it and with the fizz makes it seem almost off dry. In fact thats were we would put it. Hey it is our impression of the wine. Now not that that is a bad thing as it is a lovely hot weather starter wine for greeting guests to your soiree or just something to have on a whim because you want something a little different and tasty. This wine has become a traditional and unique white cuvée in the Günzer Winery. 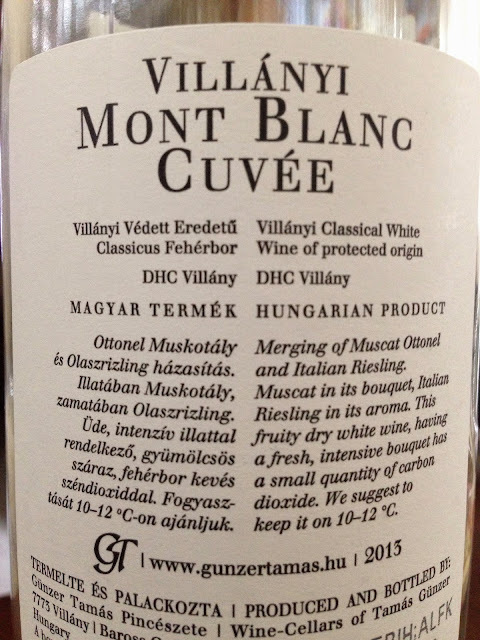 It contains Muscat Ottonel and Welschriesling and is made with reductive technology. The bouquet of this fresh and harmonious greenish-yellow wine is primarily lent by the Muscat Ottonel, while the flavor and character derive from the Welschriesling. Typified by lively yet rounded acids, this refreshing and elegant dry white wine was bottled with a touch of carbon dioxide. All in all a nice off dry yellow and orange stone fruit flavored fizzy wine thats fun and, well fun to drink. We would buy at **** and a 6 on the official scale, for those dress up bashes where something different to start is called for. A great welcome wine where usually a sparkling is poured as a welcome this would be great as a conversation starter. In a good way! Monterey County grows over 50 different varietals and yet it seems that most of them go unnoticed or at least uncelebrated as premium wines. 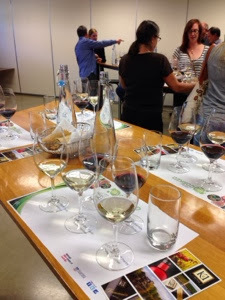 Most people tend to think of Monterey wine tasting as one long procession of Chardonnay and Pinot Noir and while that is a large portion of what is made and poured it is far from all that can be savoured. While we do really enjoy the wonderful Pinot Noir and Chardonnay that is made and poured in Monterey we also like Cabernet Sauvignon, Syrah, Merlot and Malbec as well as many other wines.With this being Cabernet month (Cabernet day is August 28th) we turned our attention to Monterey Cabernet and dinner time. When thinking of Cabernet most peoples thoughts go immediately to Napa or even Paso Robles but you may be surprised to find some equally good reasonably priced Cabernet and Cabernet blends right in Monterey County. 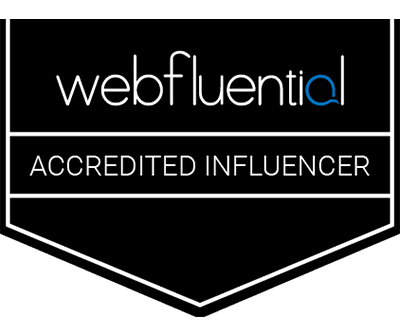 With Cabernet Day just around the corner we at WineWalkabout decided that we would sample some of the best Cabernet Sauvignon poured in the local tasting rooms and let you know about what we chose to drink with our meals and that we really liked. 2011 Rancho Galante Red Wine. 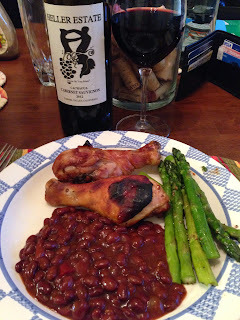 This is a blend of 51% Cabernet Sauvignon,19% Malbec, 19% Petite Sirah and 11% Merlot. 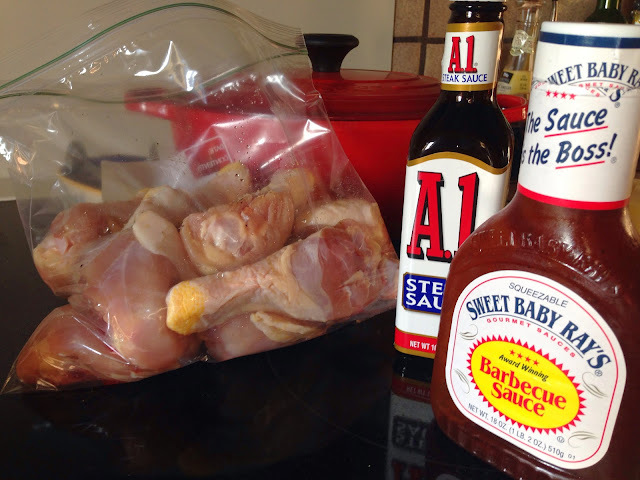 Lets start by saying this is a prerelease bottle and we would recommend a little air to start this one off. Once it has relaxed this wine is a cracker. This medium bodied blend has a bright garnet color with a sweet, cedar-box raspberry and red fruit nose with a hint of cinnamon. The flavor on the palate follows the nose with slightly sharp tannins (air time softens them up) that provide a lovely medium long finish. 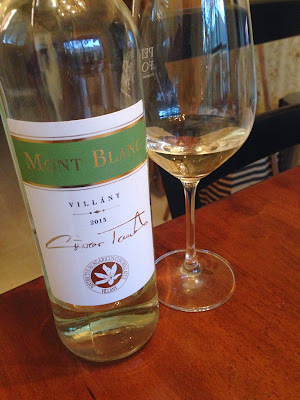 This **** wine is a 6-7 on the scale and a great go to any night of the week. 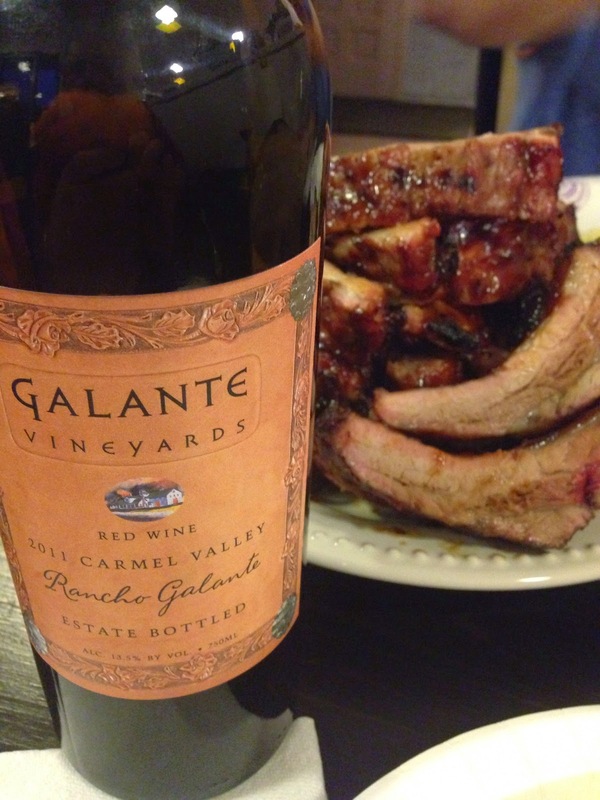 This wine went great with the pork ribs and it would probably go even better with some beef ribs or steaks or about any red meat. This is also just one of a few Cabernets that Galante Vineyards produces. One in particular we tasted that was a real attention getter was the 2009 Red Rose Hill Cabernet. 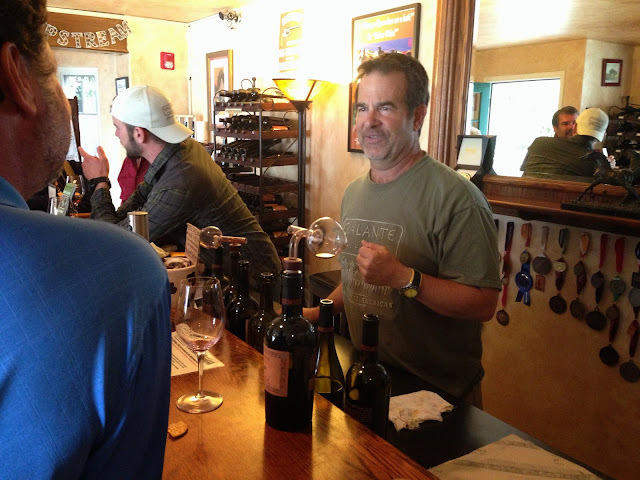 Get on over to the Wine Tasting Room and Western Emporium in beautiful Carmel-by-the-Sea. 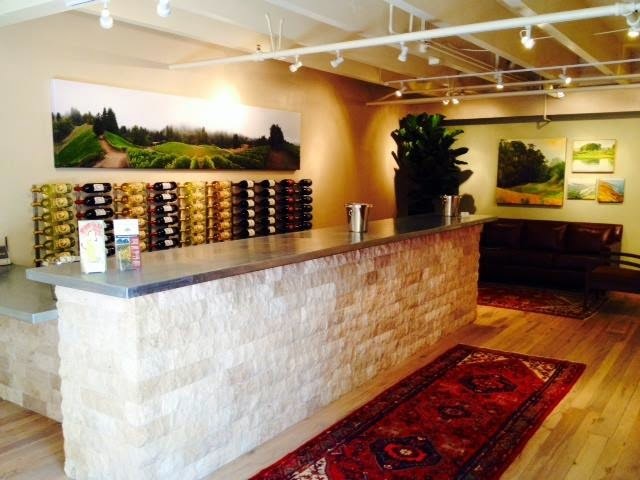 Located off Dolores between Ocean and Seventh Ave. Galante Vineyards was Carmel's first "Wine Tasting Room." so get on over and go thru a tasting and find your favorite. Oh Carmel by the Sea, what an enchanting place it is. Made even more so we believe by the number of wonderful tasting rooms at which you can sample a fantastic cross section of Monterey Wines. When in the lovely town of Carmel by the Sea there is this great wine tasting package called the Carmel Wine Walk by the Sea with 12 wineries for your selection (see previous article), but wait, there are now two more joining the group. The Alexander Smith Tasting Room and Windy Oaks Estate Vineyards and Winery. Having recently attended the grand opening of Alexander Smith and also just this last weekend the Windy Oaks Grand opening we can say that they are going to fit right in with great wines nice spaces. 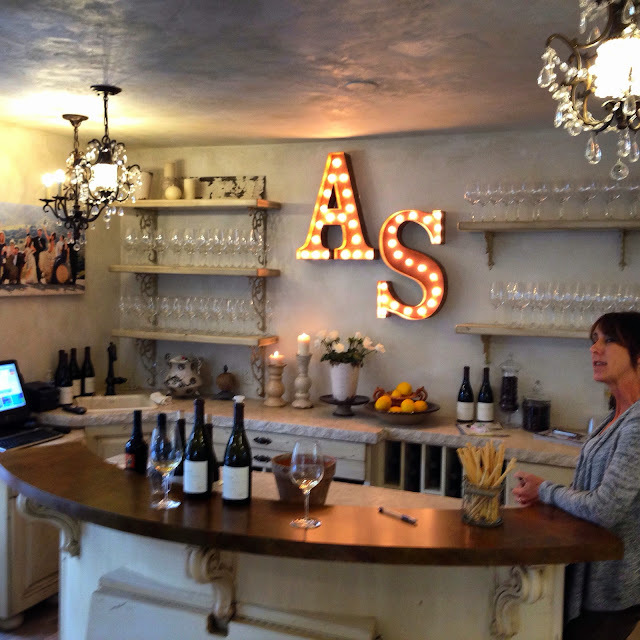 The Alexander Smith tasting room is located in the Court of the Golden Bough, on Ocean between Lincoln and Monte Verde Street and is a bit hidden away in the back but be persistent and you will find yourself enjoying a lovely Riesling, Chardonnay and killer Pinot Noirs. The new (previously Paraiso) Alexander Smith Label is the families way of returning to making hand crafted small batch wines that reflect the family vineyards. They have succeeded in a big way. The wines are all very good and will gather a loyal following. 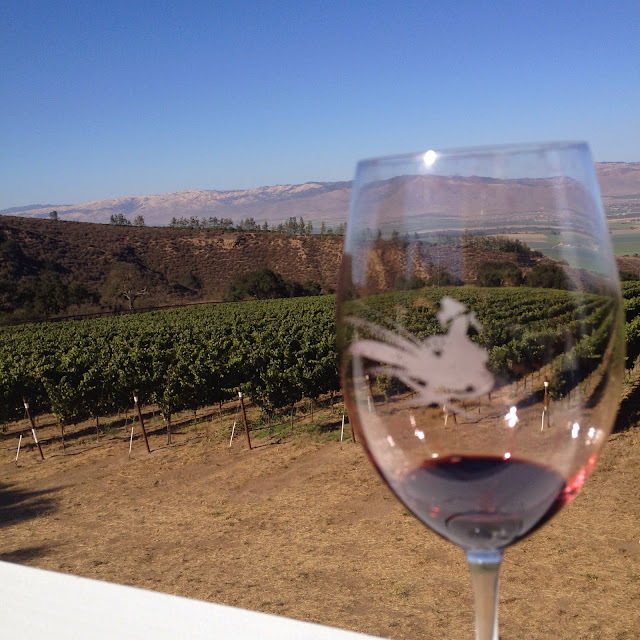 You can also get a taste of these wines at their River Road Tasting room at the winery that boasts some of the best views of the Salinas Valley and the Gabilan Mountains. This new tasting room in Carmel will become one of the top places to stop for a tipple or two with it's cool classy comfortable atmosphere and the good wines will have you returning with every visit. One afternoon while visiting another of the Carmel Wine Walk Tasting rooms we saw a flyer announcing the newest tasting room open in Carmel. Never shying from the hard work we took off over to check em out. 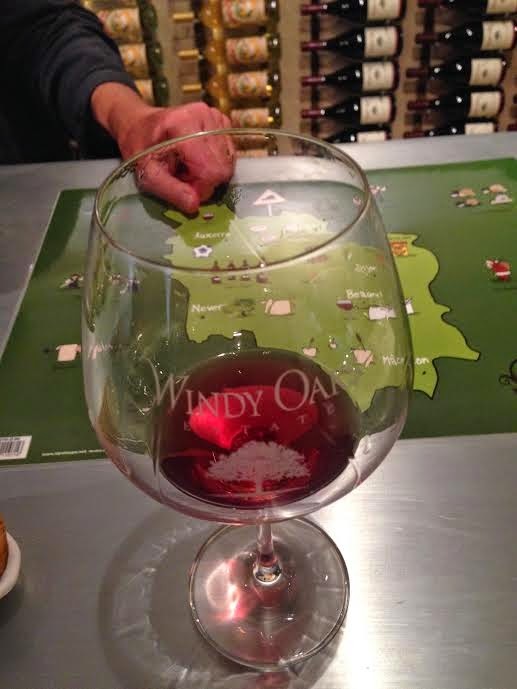 The Windy Oaks Estate Vineyards and Winery tasting room in Carmel is located in Su Vecino Court, on Dolores between 5th & 6th. Also a little hard to find but well worth the effort. Head on back into the courtyard and about 40 paces in you will find them on the right just as you go under the two story building. With vineyards in the Santa Cruz mountains and grape sourcing arrangements in Monterey including the Santa Lucia Highlands they have a lovely selection of wines to taste. Starting with a Sauvignon Blanc, Chardonnay and on to an array of lovely Pinot Noirs that show the diversity of the vineyards and terrior. They also have a great little GSM for everyday drinking. With these two great additions to the Carmel Wine Walk by-the-Sea Wine Tasting Passport, that for $65 entitles the buyer to one $10 flight at any nine of the twelve fourteen tasting rooms who are part of this experience (a $90 value). 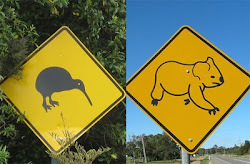 Just another two reasons to visit this wonderful sea side hamlet. 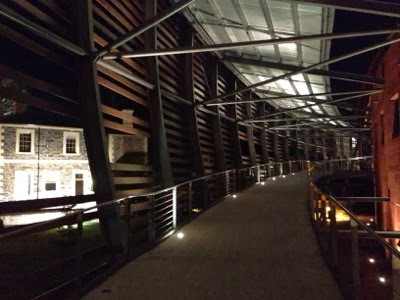 For those who have been following for a while, you probably have read a story we wrote in 2012 about the National Wine Centre of Adelaide South Australia. 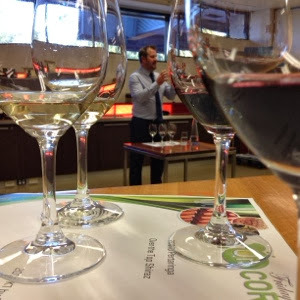 A year later we found ourselves drawn back to the National Wine Centre to see if the first go around was just one of those times when things just fall right, and what is just normally a regular event, turns into a great one. Well lets get that theory out of the way. This current event was just as good and then stepped up a notch. Yeah that's right, stepped it up a notch. The Meet the Maker and Uncorked evening was with K1 and Pertaringa. Taking charge of a diverse group from neophytes to ponces, was Shane Harris, Winemaker and Brand Ambassador. Showcasing three vintages of Gruner Veltliner, Shane walked us through the 2011,2012 and 2013 and we experienced the evolution of the vintages as we were told of each years differences in weather, and some of the changes of approach to the picking and wine making, as each years lessons were absorbed and the new knowledge applied. Shane then introduced us to some Pertaringa Shiaz. With a lovely 2010 Over The Top as an opener, and then the renown and revered 2010 Yeoman to finish off, it was simply fantastic. It seemed like every one there was very happy and thoroughly enjoying themselves. Shane was expert at talking through the processes and the wines in a way that all were engaged and entertained. After the Master class it was upstairs to the open Uncorked gathering with lovely acoustic music and song as well as food and wine specials, and to my surprise, Geoff Hardy himself there to greet those who attended. Spent a while having a chat with both Shane and Geoff, and look forward to bringing you a future story of our visit to Geoff's winery. Geoff chatting with an attendee. These Friday evening Meet the Maker Uncorked events are held each fortnight on a Friday (yes we know the title give's the day away, but) from July through December. 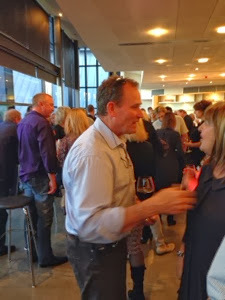 They are a wonderful informative wine tasting, with some of South Australia's best wineries and personal Q&A with owners or wine makers at a cost that is next to nothing. How much you ask? As of this series just $20. Worth easily three times that, and with another one coming up we will be heading back ASAP. With limited seating you will need to book, so get on the horn and go check em out. Rated a "Must Do' if you are in Adelaide and have the opportunity!